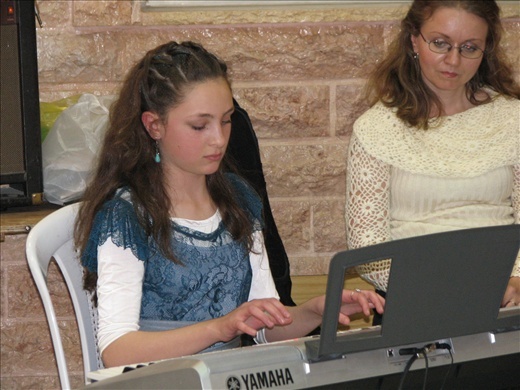 Today is the day of Tiferet’s (David’s niece) Bat Mitzvah, which is being held at the family’s synagogue in Ma’aleh Adumim, where they live. Ma’aleh Adumim is in an Israeli territory just outside of Jerusalem. In Israel, the term “territory” is the preferred term to describe contested land currently occupied by Israelis. Ma’aleh Adumim is in an area of Israel that we know as the West Bank. Many people have heard of Bar Mitzvahs, which are celebrated when a Jewish boy reaches the age of 13; but they are less familiar with its female equivalent, the Bat Mitzvah, which is celebrated when a girl reaches the age of 12. Both celebrations are big events in the life of Jewish youth because they commemorate the age at which the girl or boy accepts the commandments and must abide by Jewish law (prior to this age, the parents are responsible for them). This is the first Bat Mitzvah that I’ve had the honor to attend, so I was eager to see what it was like. To the unknowing eye, it looks like a wedding reception. At the entry of the synogogue’s reception hall, a table is set up with an album for guest signatures and a basket for gifts. A photograher busily snaps photos of Tiferet, who looks beautiful in a lace turquoise dress with matching glitter in her hair. Soon, guests begin to trickle in, all dressed for a party—women and girls in their dresses, and men and boys in their dress shirts and yarmulkes. A few young boys Tiferet’s age look subdued in the wake of all the girls, but they hold their own. Food is an important part of any Jewish celebration, and this is no exception. The guests soon begin to gather around heavily laden tables to partake of a delicious kosher meal that includes soup, bread, quiches, vegetables, hummus, pasta with cream sauces…even sushi, courtesy of Tiferet’s brother Natik. All of the food is vegetarian because to be kosher, you can have either meat or dairy at a meal, but not both at the same time. Israeli music provides the background as the sounds of talking, laughing, and eating fill the air. Although this is a traditional Orthodox gathering, it is also thoroughly modern—a few girls huddle together to giggle over a text or share a tube of lip gloss, and the glow of the iPhone oracle occasionally makes an appearance. Even a traditional brass menorrah in the corner of the room has energy efficient bulbs. As the feasting winds down, Pam, Tiferet’s mother, stands in front of the microphone to address Tiferet and give her a blessing, followed by Tiferet’s father, Yehuda, who does the same. Then, Tiferet rises and performs a selection of both modern and classical tunes on the piano, including Mozart’s Turkish Rondo and a lively rendition of The Entertainer. Her piano teacher sits nearby nodding and following along with the music, listening to her pupil with a mindful ear. After the performance, a group of Tiferet’s friends perform a song for her, and then the dancing begins. In an Orthodox group, boys and girls are typically separated during the dancing. As a result, a partition goes up to separate the dance floor into equal parts. When the live music begins, the girls fill the dance floor, exuberantly dancing to the music as the photographer surveys the room looking for his next shot. There are fewer boys at this particular gathering, so as the dancing progresses, the partition that separates the sexes mysteriously inches out farther and farther to make room for the girls, and soon the boys are relegated to a small space near the kitchen. The partition is largely symbolic, so boys eventually abandon their paltry dance floor to sit and watch the girls. The dancing eventually winds down as guests disperse to feast on cake and ice cream before they depart. They laugh and chatter amongst themselves and an exhausted Bat Mitzvah girl heaves a sigh of contentment. A few groups of giggling girls, full of sugar-fueled energy, hang around outside chatting and laughing, unwilling for the evening to end. And that’s the Bat Mitzvah—fun, food, music, laughter, and dance. A lovely (and lively) party to celebrate an important coming of age in a young Jewish girl’s life.